Thank you. Two small words that are easy to say, but which contain considerable power. Obviously, you say “thank you” to your customers when they buy from you. You probably send an automated “thank you” email message. Or, if you operate “face-to-face”, you may shake their hand, smile and say “thank you very much”. Some companies even send “thank you” gifts for new customers or show some form of appreciation, such as a discount coupon, or a free upgrade on some item. 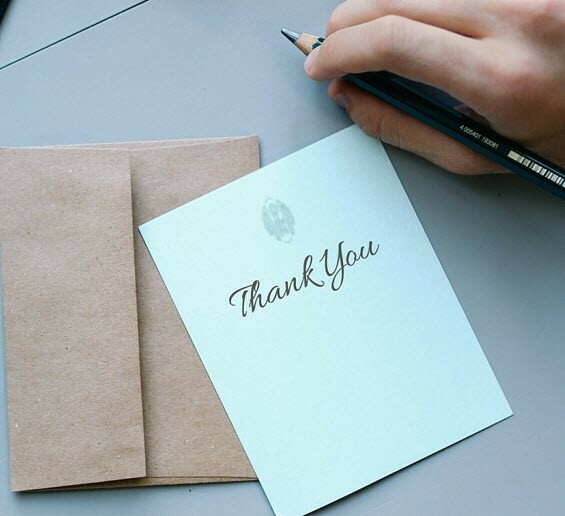 Saying “thank you” is, for most businesses, an everyday occurrence. For this reason, we tend to underplay its value. We tend to see it as “normal”, as usual, as just expected behaviour. So we do the “expected”, providing the required “thank you” and leave it at that. One of the reasons we are inhibited with our “thank you” messages is because we do not wish to appear as “gushing”, or over-familiar, or patronising in some way. Most business people hold back with their “thank you” messages because they feel that the recipient of our thanks will find it awkward and embarrassing. So, what most business people tend to do is what they perceive as the minimum. This is confirmed in new research on the effectiveness of “thank you” messages conducted at The University of Chicago. This study revealed that we tend to undervalue gratitude. What the researchers did was to analyse saying “thank you” from the sender and the recipient’s points of view. The senders significantly underestimated the positive feelings of the recipients of “thank you” messages. Equally, the senders significantly underestimated how surprised the recipients would be at getting a “thank you” message. The research showed that people held back from sending “thank you” messages because they overestimated how awkward the recipients would feel about getting them. In other words, potential senders of “thank you” messages hold back because they think the recipient will not like them. In reality, the recipients love them. The sender, meanwhile, feels awkward about them. There are hundreds (if not thousands) of studies which show that customers who get thanked tend to stay loyal to a firm. The more you thank a customer and show appreciation, the more they are likely to buy from you. So it would appear that many businesses are preventing themselves from doing as well as they might by not saying “thank you” enough. One of the reasons behind this could be that sending letters is a “dying art”. Research conducted last year showed, for instance, that 43% of Millennials have never written a letter. Not only might these individuals be inhibited from sending a “thank you” letter, but they also don’t know how. Sending out an automated response is OK, but it is so commonplace it has the potential to be of no value to people. They expect you to do this. As a result, it doesn’t help establish any real sense of connection between the customer and your company. A “thank you” message needs to be somewhat unexpected if it is to have an impact. You can do this by writing them a letter and posting it to them. Radical; but impactful. Equally, you could send a card in the post, perhaps using one of the digital to post services, such as Moonpig. A gift is often a useful idea too. You can use social media to find out the interests of the individual and send them something which is more personal than a bunch of flowers. For instance, a couple of years ago I signed up a new client who was interested in Welsh rugby. So I sent him a book on the history of the topic. Not only has he stayed loyal, but he has also recommended me to several other firms. It was a small gift that had real personal value. If you feel awkward about sending such gifts, this new research from Chicago suggests you are not alone. The problem is that this inhibition is preventing many businesses from achieving greater customer loyalty and more business as a result. Say “thank you” in unexpected ways, more often than you think you should. If you feel you should not send a thank you card or gift, then that’s clearly exactly the moment you should do so. Shrug off these inhibitions and do what your customers want you to do, which is thank them for their business. Super informing. Here i am thanking you (and you’re not even my customer haha)!